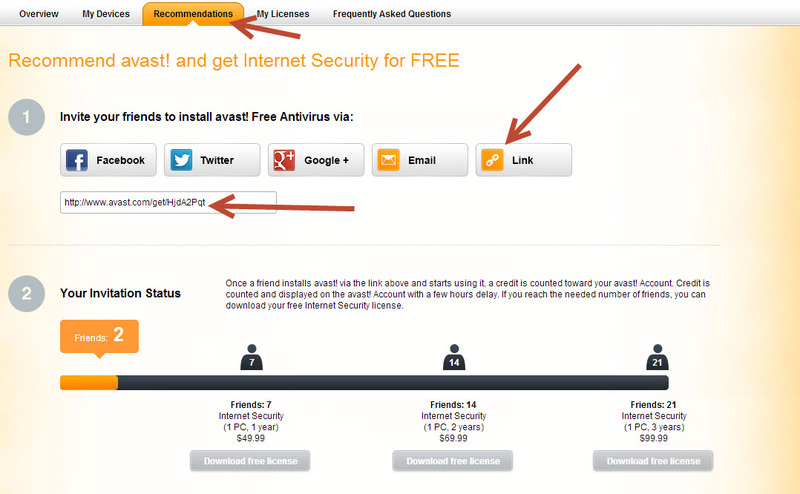 Recommend Avast Free Antivirus and Get Internet Security for FREE! During my college days I stayed in my college hostel where many students come to me asking which antivirus should I use? from that time onward I’m recommending avast free antivirus for all of them. If they launched this program in early days then I could get even more referrals counts in this programs. Anyways, at least from now onwards we can get credit for our referrals. This program is very simple, the only thing we need to do is share the unique referral link with friends or anyone and if that user installed avast free antivirus from your link and started using that, then you will get credit on your Avast account. Once you reach minimum number of referrals then you can download Free License key of Avast Internet security which is pro version. I came to know about this service recently, So I just posted it on my Google+ account and updated one of my blog post here with my referral link. When I see the stats on Avast I already got 2 credits. I think it’s not really difficult to promote this offer. Currently this program is in beta stage and they still not yet announced this news on their official blog but they have announced this on their official forum. 2. click on Recommendations tab, then click Link and get your referral link and start sharing your link wherever you want. Once you recommend minimum number of friends (currently it is 7) you can download Free genuine license key of Avast internet security. If you are thinking to download Avast antivirus then use my referral link. hi. i m faceinng problem with my BSNL Dlink broad band..